I had never given much thought to ancient anchors before visiting Apollonia Pontica (Sozopol) a Megaran colony on the Thracian coast. The place was littered with ancient anchors dredged up by fishermen. Two main types : one with a wooden shaft and flukes and a stone or usually lead stock. Maybe for more prestigious vessels. and one with less wood involved - basically a flat slab of stone with three holes. Two for pales which act as flukes and one to secure the anchor cable to. Simple and cheap but effective. As fitted for an anchor. The sheer number of these things : I saw tens of them : which date back to the centuries B.C. gives pause for thought as to how many vessels sailed the Pons Euxinus in the era of the galley. 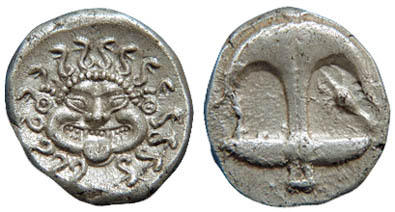 The coins of Apollonia and nearby Messembria show anchors of the complex type. and the local traditional fishing boat, the 'alaman' which had eight oars and a small sail but has no heritage older than c.1700. On a more sci-fi note I got a trip on a Kometa-class hydrofoil as constructed in 1983 in Ukraine SSR. 35 knots ! excellent.... When I was a lad this is how ships of the future should have looked.